I have been a fan of Harry Potter since I first read the books when I was twelve years old. This Harry Potter robes DIY is here to make your like easier after being on a search of dressing my little ones as the characters and making the dream a reality! We have Jackson dressing up as Harry, Jayne as Hermione, and Jett as Ron. I mean, come on, Jayne makes the perfect little Hermione! Because there are so many pieces to the Harry Potter costume I wanted it to look authentic but also not break the bank. I decided to buy them official looking Hogwarts scarves and ties but I did NOT want to spend $20+ dollars on each robe. I even went to the fabric store and almost had the fabric all cut when I realized that it was just too much money to justify a Halloween costume…even though I wanted to BADLY. Lucky for me I stumbled across an idea to use a t-shirt as a robe and Joanns’ happened to have a sale three shirts for $9. YES! I can do that. Making this tutorial was something as an afterthought. I had already made two and was rushing to make the third when Melissa suggested I share this tutorial. So these robes are actually the ones I made for Jett. When I made the robes for Jackson and Jayne I actually had them lie down on the t-shirt to get a better idea of where to cut the sleeves along side their bodies, but as this one was for my baby I knew he wouldn’t lie still! I did cut one of his arms/sleeves a little small, it still works, but I should have left a little more room. 3. Cut a line right up the middle of the front of the robe. 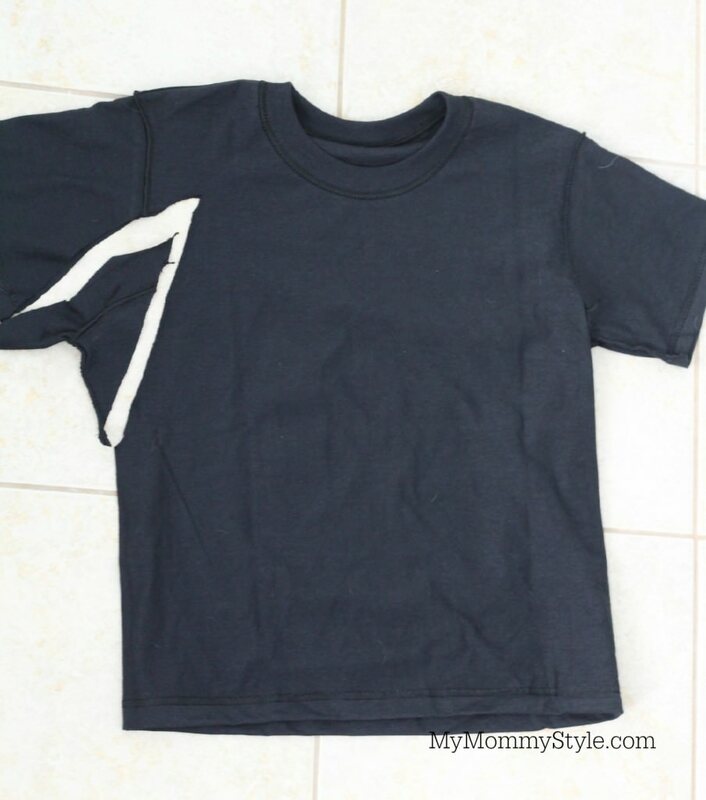 The t-shirt will naturally roll when cut. I used this to my advantage and did not use pins to sew it up the side. I did use a tight zig-zag stitch to finish the arms and seam up the front. 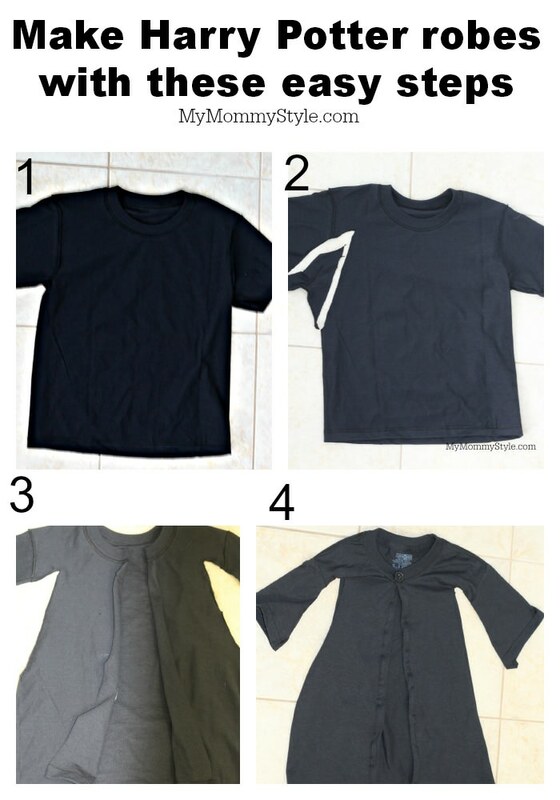 (sew this with wrong sides together), once you are done sewing turn it right side out. And there you have it! 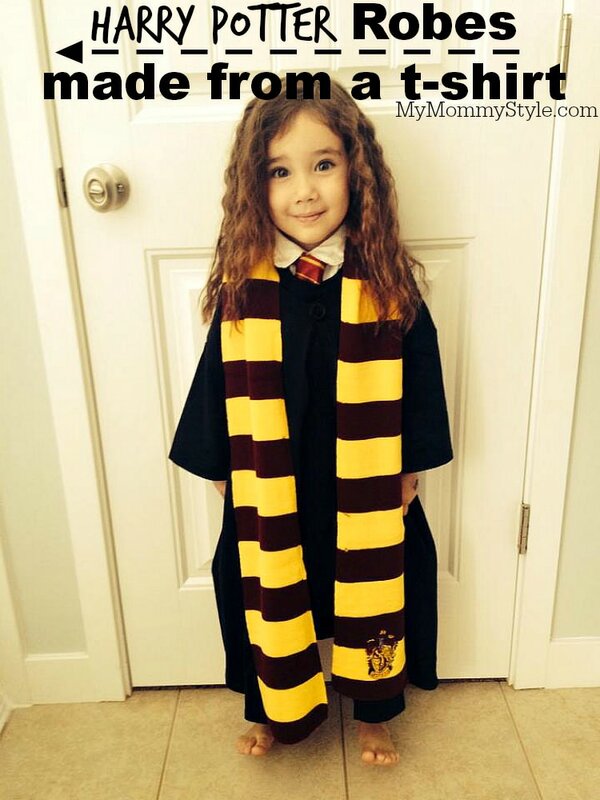 Quick and easy Harry Potter robes that your kids will love. I also ordered the Gryffindor patch to put on the robe but it hasn’t come in the mail yet. Sorry, this is such a quick tutorial, please let me know if you have any questions! Linked up with Posed Perfection and Saving 4 Six.